Operation system: Microsoft Windows 7/WIndows 10, 32 or 64-bit. SpecTrack is a software primarily for direct tracking on stars (autoguiding) on a spectrograph’s slit. In order to obtain a stellar spectrum, most of the starlight must pass through the slit. To hold a star precisely on a slit, which itself may only be 25μm wide, presupposes many things: on the one hand, the mount should have a small periodic error; The advantage here is of mounts which are equipped with encoders and have residual errors in the range of 1 to 2 arcseconds. In addition, the polar alignment must be as accurate as possible, so that the star is positioned at the same point in the slit. 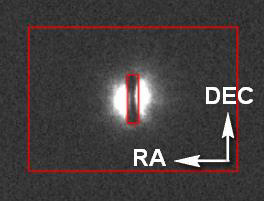 The normal case is that the spectrograph’s slit is equatorially aligned: the width of the slit, which determines the resolution of the spectrograph, should be aligned in the RA direction. This means that the slit height is aligned in the DEC direction. Although SpecTrack can handle arbitrarily oriented slits, equatorial alignment is recommended in regard of smooth guiding. If the star deviates from the slit in RA/DEC, SpecTrack corrects the position by controlling the drive with the chosen autoguiding speed. SpecTrack differs from guiding software known from astrophotography: Normally, the position of the maximum of the star intensity is detected, and the star is always held on the sensor at the same point during image recording. SpecTrack can guide on stellar profiles too, however, and goes one step further. SpecTrack can not only track stars, but also stars that “disappear” in a spectrograph’s slit. SpecTrack can be used with any slit spectrograph for tracking stars during astrophotography and stellar spectroscopy. Please also note our detailed manuals / tutorials on the Tab "Downloads"
Please note: This software has been developed primarily with and for 10Micron mounts, which are equipped with 10Micron absolute encoders and have a very high pointing and tracking accuracy. Other, less precise mounts may not achieve the same accuracy as described in the tutorial.